In Aubusson, One Discovers a multitude of Small gardens in terrace One even said that ”the Cabblages fell into the pot, directly by the chimmey”. 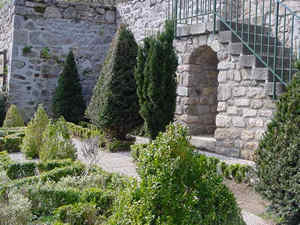 -The Aromatic Garden rue de la roche, on the way which leads to the tower of the clock. Of more modest size, he wants to be teaching. The species harmoniously distributed in the small spaces bordered of boxwood have each one their virtues.